The OctoPre stand-alone eight-channel mic preamp and (sometimes optionally) A-D/D-A converter has, in one form or another, featured in Focusrite’s product range since the Platinum-series OctoPre first saw the light of day in 2002. Its immediate successor, the OctoPre LE, followed in 2005 and both models were replaced in 2009 by the OctoPre MkII and the OctoPre MkII Dynamic. The latest variant, reviewed here, is the Clarett Octopre. 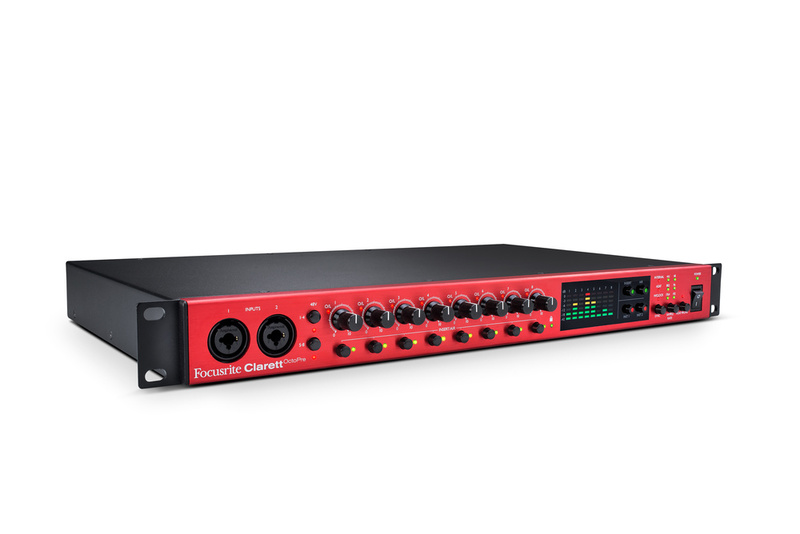 Essentially, this new version takes the company’s Clarett 8 Pre Thunderbolt audio interface (reviewed in SOS October 2015: http://sosm.ag/focusrite-clarett-8pre), strips away the MIDI, S/PDIF, and DAW-related facilities, and repackages (and slightly enhances) it. So what we’re left with is an eight-channel mic preamp and ADAT-format A-D/D-A converter that can be used either stand-alone or to expand the input/output capability of any audio interface, stand-alone recorder or mixing console that’s fitted with ADAT digital I/O. On receiving the review model, I was pleased to discover that the chassis is extremely well built and, to my eyes at least, the superbly finished front panel looks gorgeous in its blood-red variant of Focusrite’s signature hue. Internally, you’ll find beautifully laid out circuit boards studded with high-quality components; like its forebears, this is a unit that’s built to last. The layout is reminiscent of its ancestors too, with front-panel inputs on combination XLR/TRS jack connectors to its first two channels and similar rear-panel inputs to the remaining six. Two switches sitting adjacent to these connectors route phantom power to all eight XLR mic-level inputs in two banks of four. The TRS inputs can accept either balanced or unbalanced cables and a further pair of switches (situated to the right of the meter display) can be engaged to configure the jack inputs on channels 1 and 2 as instrument inputs. Eight rotary controls, each with an overload LED, set the channel gains. Beneath these sit eight Insert/Air buttons: Air modifies the mic preamp’s frequency response to emulate the impedance and resonance characteristics of Focusrite’s transformer-based ISA mic preamps; and Insert brings the channel’s rear-panel, post-Air, TRS jack send/return loops into the circuit. Thoughtfully, the insert loops are normalled internally, so you don’t lose signal if you switch an insert on while there’s nothing connected to the loop. A bi-colour LED indicator under each of the switches glows green when the insert loop is active on its channel and yellow when Air is engaged. The mode selection depends on the setting of the two master buttons above the Channel 1 and 2 Instruments switches, and only one can be active at any one time. When Insert is active, the buttons switch relays that put the loops in circuit and, likewise, when Air is active, relays are switched to bring that function into play. The one disadvantage (for my way of working, at any rate) of the Clarett OctoPre’s Insert/Air setup is that a channel’s insert switch can’t be used as a hardware mute button unless there’s an open insert cable (an unterminated TRS jack would also do the job) occupying the insert jack socket. On the extreme right of the front panel, two more buttons select the sync source (internal clock, external clock and incoming ADAT signal) and one of six possible sampling rates (44.1, 48, 88.2, 96, 176.4 and 192 kHz). A final switch routes the incoming ADAT signal to the line outputs via the D-A converter. The dual ADAT ports cater for eight channels at up to 96kHz, or four channels at higher sample rates up to and including 192kHz. In addition to the six XLR/TRS combination connectors and eight TRS insert send/return loops, the Clarett OctoPre’s rear panel is home to a Tascam audio-format 25-way D-sub connector, which carries the unit’s eight line outputs. There are also two ADAT-format input/output pairs that pass two I/O streams, containing channels 1-8 (44.1 and 48 kHz), channels 1-4 and 5-8 (88.2 and 96 kHz), or 1-2 and 3-4 (192kHz). Finally, a pair of BNC word clock I/O connectors and the unit’s IEC mains socket complete the unit’s I/O complement. Plumbing the Clarett OctoPre into your setup shouldn’t pose any problems, providing that you own a Tascam-format eight-channel D-sub audio loom terminated with your choice of analogue connector, and a couple of Toslink cables for the ADAT I/O. If, like me, you frequently switch between multiple XLR mic and TRS line sources then you’re going to miss having separate mic and line inputs, but a potential workaround is to use the insert return as a switchable unbalanced line-level input via the return leg of an insert cable (you could make up a custom loom if you’d prefer). To meet my own needs, I’d hook up the insert loops and line outputs to a patchbay alongside my hardware EQ, dynamics and effects units so that I could use the inserts either as mutes or line inputs, or patch in my external processors when desired. Not only can the Clarett OctoPre act as a stand-alone eight-channel mic preamp (in which role it can output the eight channels as analogue audio at line-level and digital audio via ADAT, simultaneously) but also, when the ADAT to line switch is engaged, it can route an ADAT input signal to its analogue line outputs, whilst continuing to output the eight microphone signals in ADAT format. In other words, it becomes an eight channel A-D/D-A converter with mic/line inputs being routed to its ADAT output, and its ADAT input being routed to the line outs. That versatility isn’t offered by all competitors, and on previous-generation OctoPres installation of an additional daughterboard was required! Performance-wise, I was impressed not only by the clean, transparent character of its mic preamps, but also by the extremely low noise floor and 118dB of available dynamic range. In addition, the contribution from the Clarett OctoPre’s 24-bit analogue-to-digital and digital-to-analogue converters to the overall excellence of its performance can’t be ignored. Activating the Air emulation results in an attractive (and rather addictive) high-frequency boost that doesn’t pass unnoticed. Although, personally speaking, I’d tend to keep Air in circuit more-or-less permanently, and deal with any treble excesses further down the line, I couldn’t help but think that being able to vary the amount of the effect, even on a global basis, would have been a nice feature. The original OctoPre was replaced by lower-cost models and, while those with a tight budget might have welcomed that, I’m pleased to see Focusrite head back in the opposite direction this time, with a product that delivers serious audio quality at a mid-market price — the Clarett OctoPre boasts a level of performance that more than justifies its cost. In fact, this is, in my opinion, a stunning piece of kit for the money and, due both to its impressive specifications and its versatility, some higher-priced alternatives will find the Clarett OctoPre snapping at their heels. If you own an audio interface or digital mixer that accepts an ADAT input, and are in need of some higher-quality mic preamps or additional inputs, this should be right up at the top of your audition list. There are various ADAT-equipped mic preamps, each with their own particular selling points. Among those to check out are Audient’s ASP800, the PreSonus DigiMax DP88 and products by Midas and RME. Switchable insert points on each channel. Switchable Air emulation on each channel adds sparkle to a sound. Can output digital ADAT signal from mic preamps while converting ADAT input to analogue output. Its high level of analogue and digital performance makes it excellent value for money. The amount of Air is fixed — on some sources, I missed the ability to vary it. With eight superb mic preamps, 24-bit 192kHz-capable converters, ADAT plus analogue outputs and a far better sonic performance than its price suggests, the Focusrite Clarett OctoPre is an extremely attractive proposition for anyone looking for more inputs and outputs. American Music & Sound +1 800 431 2609.